Mailed 11/14/13 to Subscribers. Allow 4-6 weeks for USPS delivery. 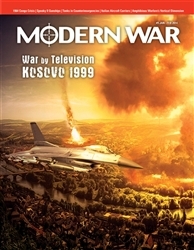 War by Television: NATO and the Serbia/Kosovo Crisis of 1999 with particular emphasis on the crucial role of airpower. It’s said to have been the first war in which airpower alone achieved victory – or was it? USMC Over the Horizon: Analysis of the extreme evolution forced on the US Marines’ amphibious assault doctrine during the past 25 years due to the advent of ever-deadlier Surface-to-Ship Missles (SSM). Congo Rescue: Belgian airborne forces, delivered by US air transports, freed hostages in 1964's Congo Crisis. Spooky Gunships: US Air Force special operations aviation. Italian Aircraft Carriers Today. Analysis of the Italian Navy’s small but modern carrier force.